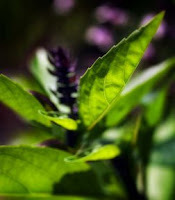 Every where I go, I am uplifted by the fragrant bouquet of basil… Thai, lemon, sweet, purple…I love them all. Basil adds a freshness to most foods that make it taste like summer in a biteful. I recently picked up a basil plant for my friend Darlene as part of her birthday gift and it got me craving some fresh homemade pesto. Now I'm sitting here scratching my head and thinking, "I should have picked up two!" So off I will go this weekend to pick up a big leafy plant for myself. Sunday I plan on a date with my food processor and this fragrant herb. I often make pesto in big batches. It keeps well in the refrigerator for up to one week or in the freezer for up to three months. Experimenting with how to use this ambrosia is of course a big part of the fun. The last time I concocted an appetizer that two of my sisters flipped for. One had never had pesto! For now, I'll post my basic recipe. Later on, once I've made it myself, I'll post some photos of some of the ways I like to use it including the above mentioned appe. To start, pan toast the nuts. In a dry, nonstick heated skillet, place the walnuts and pine nuts constantly shaking them around to keep them from burning. The idea is to lightly brown the nuts to bring out their nutty goodness. Remove from pan and let cool for 15 minutes. Once the nuts are cooled, place them and the garlic into a food processor, pulsing a few times to get them into a coarse consistency. Add the basil and spinach a little at a time, pulsing between additions. Slowly add the olive oil in a constant stream while the food processor is on. Stop to scrape down the sides of the food processor with a rubber spatula (add a few tablespoons more oil if it’s too thick/dry). Add the grated cheeses and pulse until well blended. Add salt and freshly ground black pepper to taste. Place in an air tight container, pouring a little olive oil over the top to just cover so air won't come into contact with the basil. Store in the refrigerator. YOUR TURN: Do you have a favorite way to use pesto? Ever make it yourself or do you have a favorite store bought brand?